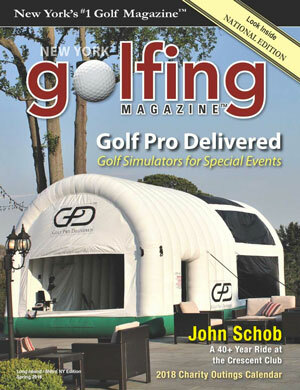 Daytime or nighttime, people gather at events around a mobile golf simulator. Golf simulators can be stand alone items, or can be part of a golf ecosystem at the event and be surrounded by golf putting greens (mats with “holes” in them, chipping areas, nets for hitting balls, TV screens so that everyone outside the simulator can see what is going on inside the simulator, and other items like having a bar set up, a products display, a silent auction display, and even a buffet or food service area. Why is the mobile golf simulator such a crowd pleaser and why does it have the ability to bring people together. First of all, there are very few of them in the world, but more are being built every day due to the success of Golf Pro Delivered. Second, they provide the most welcoming experience for someone who has never swung a golf club to get a real golf lesson in just a few minutes and see how far, and how high they can hit a golf ball with great golf instruction. And, possibly most importantly, everyone is invited to participate – children, women, men, people with disabilities, people who have never seen a golf course, and it is just pure fun to hit a golf ball inside a great golf simulator. Crowds of more than 100 people can actually go through the simulator, putt on the matts/greens, chip in the chipping areas, and hit into our ultra safe nets at events. 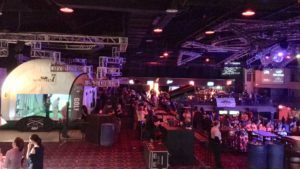 Hundreds of others can partake in the other events that surround the mobile golf simulator, and every aspect of an event benefits from the “convening power” of a golf simulator at an event. 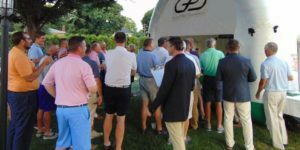 For more information about how mobile golf simulators bring people together at events, contact us at Golf Pro Delivered, [email protected] or (516) 472-7293.